This past weekend, we hosted a “Thanksgiving” celebration. Luke’s little brother Jake was home on leave from the Navy and won’t be able to make it home for the actual holiday, so we decided to celebrate early. After 3+ weeks of around-the-clock work finishing up our bathroom/kitchen/bedroom remodels (more on that later), we opened the doors to 20 family members to host our first “holiday” in our new home! The one request Jake had for the gathering was homemade pumpkin pie and since it’s also one of my favorite desserts, I happily offered to try my hand at making one for him! 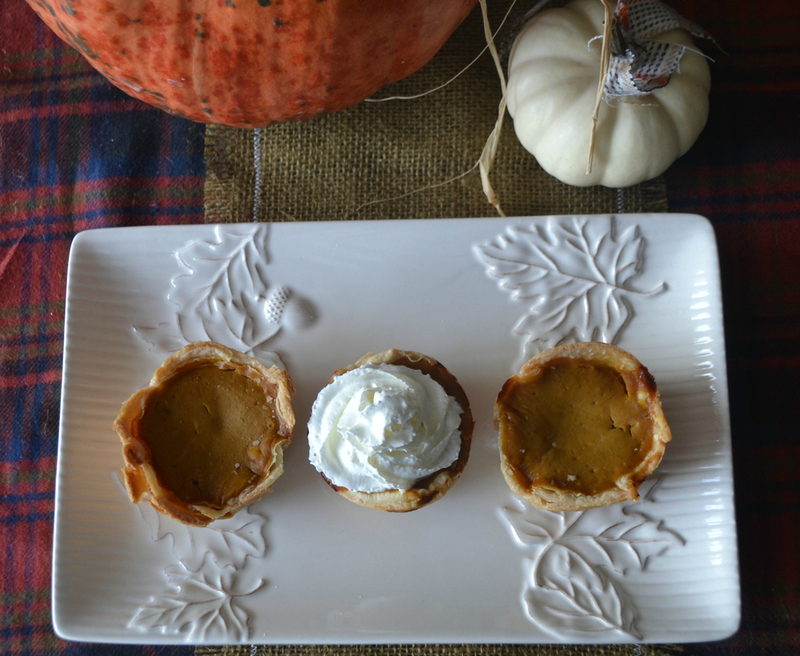 Then, Pinterest happened, and I discovered a recipe for MINI pumpkin pies. So without further adieu, here’s the recipe I used (slightly modified from the original, found here). 1. 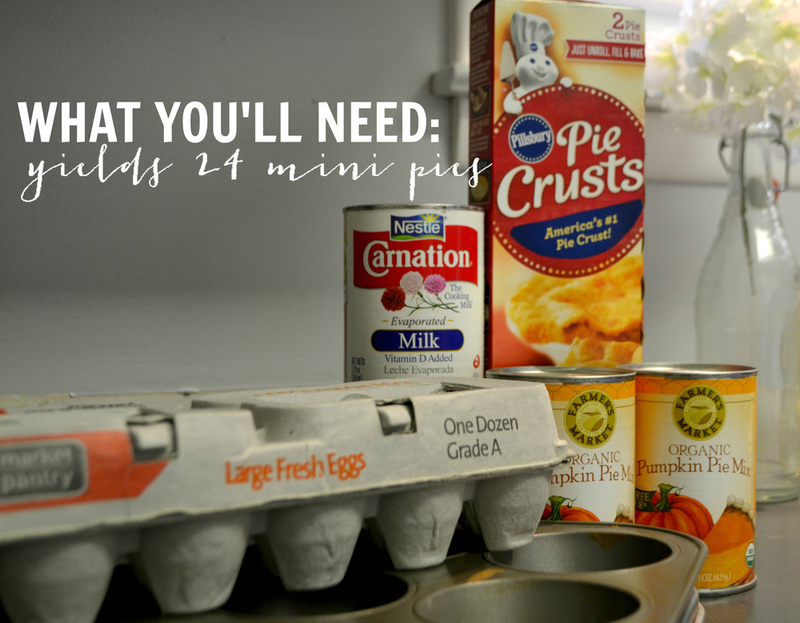 Pre-heat your oven to 425 and prepare your pie crust. I used pre-made Pillsbury crusts, so all I had to do was take them out of the fridge 15 minutes in advance for them to soften. Roll the crust out flat and use a cookie cutter (or anything with a 4″ round diameter – I used the lid of a sippy cup. I have a lot of very advanced baking gadgets, clearly) to cut 24 circles of dough out. *Each 9″ crust should yield about 6 cut circles. 2. Spray your muffin tins with cooking spray (or grease the tins using your favorite method). Place the circles of dough in the tins, pinching the tops a bit and making sure to avoid any holes. *You will have some leftover dough to fill any holes that will inevitably come up. Make sure the dough is as flat as possible to avoid it from bubbling. 3. Prepare the pie filling. I used the recipe on the back of the pie filling mix can and doubled the recipe (again… super advanced), which was just 1-1/2 cups evaporated milk, 4 eggs (whipped), and two cans of pie filling. 4. Fill the muffin tins almost all the way to the top. You may have to adjust to make sure you have enough to fill all 24 tins. *I found it easier to prepare two rounds of pie filling that way I could gauge how much to put in each tin as I went, so I used 3/4 cups of the milk and 2 eggs at a time. Totally unnecessary, but it worked, so hooray! 5. Place the filled tins in the oven and bake at 425 for 15 minutes. Then, reduce the heat to 350 and bake an additional 25-30 minutes. *Confession: I forgot to reduce the heat after 15 minutes, so mine only took about 25 minutes at 350. Oops! They still turned out fine. 6. Remove the pies from your oven when they’re finished (the crust will be slightly golden/brown and filling will be firm/un-soupy) and let cool. I don’t own a wire rack (apparently I need to go to Bed Bath & Beyond to stock up on grown-up baking supplies!) so I just let them cool right in the tins for about 15-20 minutes. Tip the tins over when they’re done cooling and they should pop right out! 7. Taste test (the best part, obviously) with a generous helping of whipped cream on top, and try to fight the urge to eat the entire batch before your guests arrive. You’re welcome in advance if you decide to try these out. Your bellies will thank you. Your waistline? Maybe not so much. 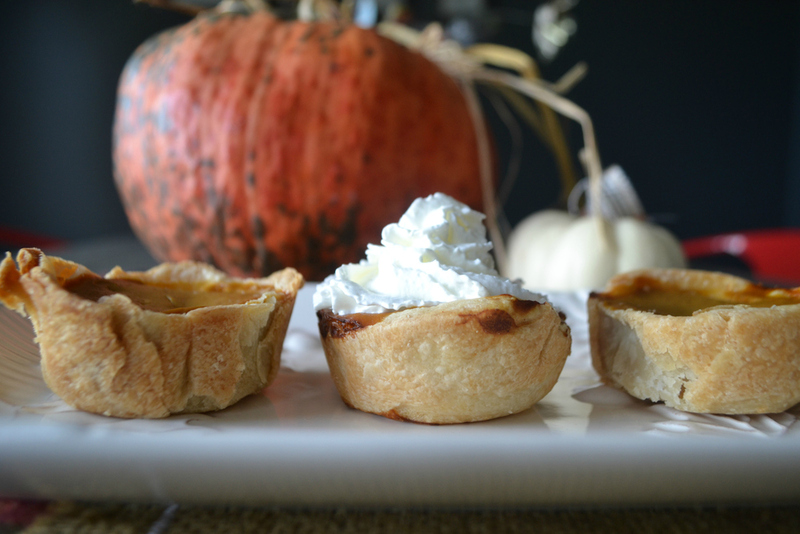 I’ve eaten the equivalent of probably an entire pie thanks to these four-bite-sized beauties, but it’s fine… because they’re MINI and that makes it acceptable – or at least that’s what I’m telling myself.